It was the day of the Budds Creek National, and a chance for Jeremy McGrath to get a leg up again on Kawasaki's Jeff Emig in their battle for the AMA 250 National Championship. Emig had won the previous round at Mount Morris, but McGrath came back with a vengeance to win his fourth round in the first five starts. McGrath's emphatic 1-1 over Emig's 2-2 gave the Honda rider momentum as they headed to Southwick next. In the 125 Class, Team Honda's Steve Lamson, the defending series champion, topped Yamaha's John Dowd and true privateer Buddy Antunez of the Great Western Bank Kawasaki team. Over in Europe, the FIM 125cc Grand Prix of France in Cuassac was a showcase for the sensational French teenager Sebastien Tortelli, who dominated on his Kawasaki KX125. The fifth round of the 2012 AMA Motocross Championship was held at Budds Creek, just outside Washington, D.C. Ryan Dungey continued his hot start to the season with his sixth straight moto win and third straight 1-1 finish. 450 rookie Broc Tickle took second overall with 2-2 scores, and Mike Alessi finished third with 4-3 scores to edge Jake Weimer’s 3-4 on the day. 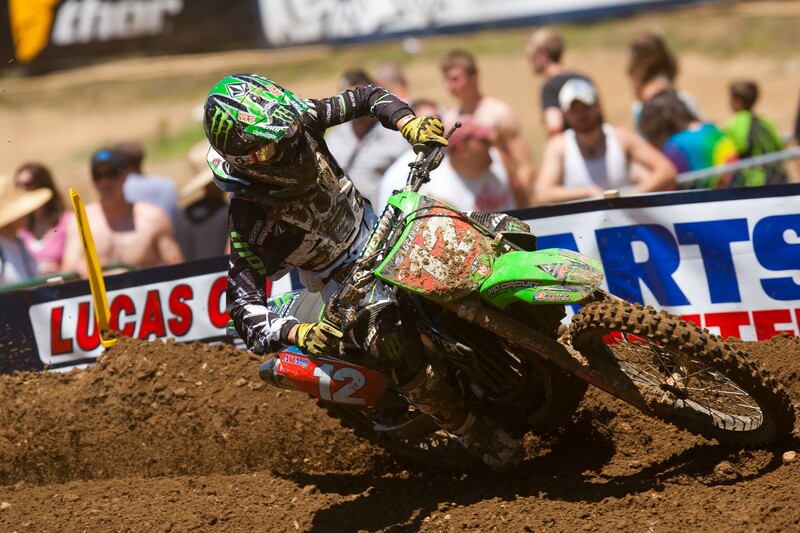 Blake Baggett put in a 2-1 day in the 250 Class to take the overall over Ken Roczen (3-2) and Justin Barcia (1-5). Ricky Carmichael continued his perfect start to the 2002 AMA Motocross season with another 1-1 performance at round five at Budds Creek. Mike LaRocco (4-2) would take second overall ahead of Tim Ferry (2-4). In the 125 Class, James Stewart also had a perfect day to capture the overall over Chad Reed (2-4) and Braden Jesseman (5-2). Lakewood Sport Cycle Center hosted the sixth round of the 1985 AMA Motocross Championship. Three classes—500, 250, and 125—ran that day, and in the 250 Class, it was Jeff Ward taking the overall with a second moto win. His 3-1 scores bested Johnny O’Mara’s 1-3. Rick Johnson took third overall with 2-4 moto scores. In the 500 Class, Broc Glover had a perfect day to capture the overall. Billy Liles (3-2) and Jo Jo Keller (5-4) rounded out the podium. And in the 125 Class, Ron Lechien took the win over Erik Kehoe and George Holland.